President Donald Trump on Friday signed a bill to fund the government through Feb. 15, leaving more time for the White House and Democrats to negotiate over border security, the impasse over which led to the 35-day partial government shutdown. Despite an expected rebound in the subsequent quarters, the CBO estimated that about 3 billion dollars lost in real GDP won't be recovered. That equals 0.02 percent of the projected annual GDP in 2019. In CBO's estimation, the shutdown hampered economic growth mainly because of the lost output from federal employees who were working unpaid or furloughed, the delay in federal spending, and the reduction in demand, which dampened private-sector activity. CBO said that the five-week shutdown delayed approximately 18 billion dollars in federal discretionary spending for compensation and purchases of goods and services and suspended some federal services. "Among those who experienced the largest and most direct negative effects are federal workers who faced delayed compensation and private-sector entities that lost business. Some of those private-sector entities will never recoup that lost income," the report said. CBO's estimates did not include more "indirect" negative effects of the shutdown, which were "difficult to quantify," such as delayed federal permits and certifications, and reduced access to federal loans. "Such factors were probably beginning to lead firms to postpone investment and hiring decisions," the report said. 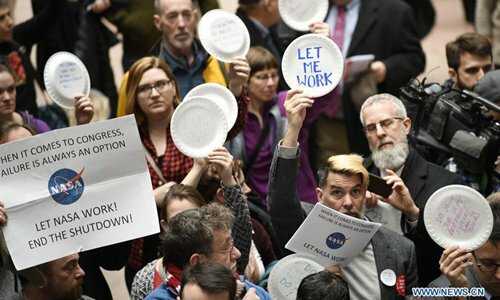 ​The record-long federal government shutdown cost the U.S. economy approximately 11 billion U.S. dollars, a report from the Congressional Budget Office (CBO) said Monday.